I had been racking my brains over what dish to make, came up with varied ideas but ultimately, because of lack of time ended up making the simple, but tasty Thalipeeth- the wholesome Maharashtrian one meal dish. 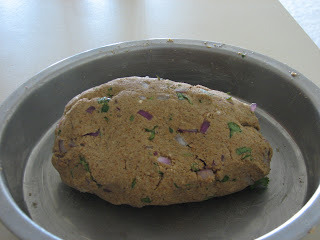 The thalipeeth is very nutritious, filling, quick and easy to make. It is basically a bread/bhakri made out of 6-7 different ingredients which are roasted and grounded to make what is known as the Bhajani. This mixture of different flours and pulses such as wheat, juwar, bajra, chana dal, rice and millet is commonly available in India. To this mixture, you add some green chillies, diced onions, chilli, turmeric and coriander-cumin powder, and there you have the recipe for the thalipeeth. Traditionally the thalipeeth is served with some home-made butter (called "loni" in marathi) or plain curd. P loves thalipeeth so much that i had my cousin get me some bhajani the last time that he went to India. So here's my entry for Nupur's A-Z of Indian vegetables. 1. Mix all the ingredients together and make a firm dough out of it. Keep it aside for 15-20 minutes. 2. Wet your palms with some oil or water and on a plastic sheet, start patting the small balls of dough into a round and even flat shape. 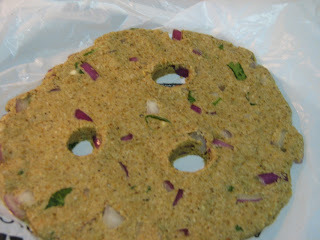 Make a couple of holes in it so that it will help cook the thalipeeth better. 3. Heat a pan and grease it with some oil. Place the thalipeeth in the pan and apply some more oil to the holes and on the sides and cook it on both sides till you see brown spots. 4. Remove and serve with some butter. Saw your blog from your comment on mine. The Thalipeeth looks yummy. What is bhajani flour? Will try to make it sometime. Thanks a lot. The bhajani flour is a mixture of wheat, rice, bajra, juwar, millet, chana dal and lots of other pulses and dals. This mixture is commonly available in india, but not here in the U.S. You can make it yourself by mixing any of these flours that you have at hand and add the rest of the ingredients as i mentioned in the recipe. Let me know whenever you try it out. 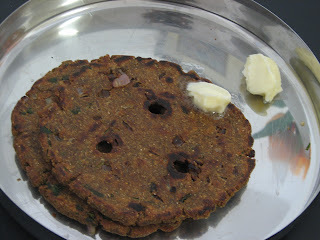 i always learn something new via nupur's round up - your thalipeeth looks simple yet nutritious and mouth-watering. thanks for sharing! Thanks a lot. I totally agree.We are introduced to such myraid, creative and mouthwateringly delicious recipes through different blogs. I am always amazed at the variety of cuisines that i come across through everyones blogs. Do let me know whenever you guys try it out. Thalipeeth atta is available in Indian store like India grocers. So you do not worry about that part . I live in the area of Marathi crowd and I make it all the time and it's yummy. It also test good with cucumber raita. It also test good with cucumber raita.